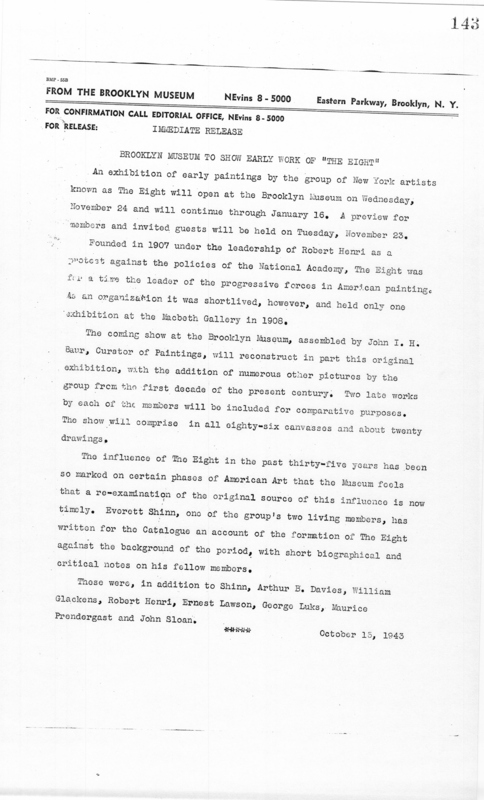 October 15, 1943 An exhibition of early paintings by the group of New York artists known as The Eight will open at the Brooklyn Museum on Wednesday, November 24 and will continue through January 16. A preview for members and invited guests will be held on Tuesday, November 23. Founded in 1907 under the leadership of Robert Henri as a protest against the policies of the National Academy, The Eight was for a time the leader of the progressive forces in American painting. As an organization it was shortlived, however, and held only one exhibition at the Macbeth Gallery in 1908. The coming show at the Brooklyn Museum, assembled by John I. H. Baur, Curator of Paintings, will reconstruct in part this original exhibition, with the addition of numerous other pictures by the group from the first decade of the present century. Two late works by each of the members will be included for comparative purposes. The show will comprise in all eighty-six canvasses and about twenty drawings. The influence of The Eight in the past thirty-five years has been so marked on certain phases of American Art that the Museum feels that a re-examination of the original source of this influence is now timely. Everett Shinn, one of the group’s two living members, has written for the Catalogue an account of the formation of The Eight against the background of the period, with short biographical and critical notes on his fellow members. These were, in addition to Shinn, Arthur B. Davies, William Glackens, Robert Henri, Ernest Lawson, George Luks, Maurice Prendergast and John Sloan. Brooklyn Museum Archives. Records of the Department of Public Information. Press releases, 1942 - 1946. 10-12/1943, 124. 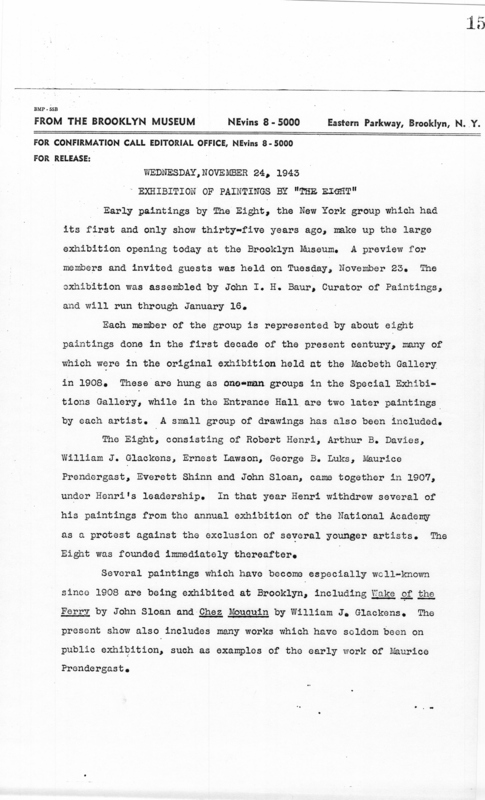 November 24, 1943 Early paintings by The Eight, the New York group which had its first and only show thirty-five years ago, make up the large exhibition opening today at the Brooklyn Museum. A preview for members and invited guests was held on Tuesday, November 23. The exhibition was assembled by John I. H. Baur, Curator of Paintings, and will run through January 16. Each member of the group is represented by about eight paintings done in the first decade of the present century, many of which were in the original exhibition held at the Macbeth Gallery in 1908. These are hung as one-man groups in the Special Exhibitions Gallery, while in the Entrance Hall are two later paintings by each artist. A small group of drawings has also been included. The Eight, consisting of Robert Henri, Arthur B. Davies, William J. Glackens, Ernest Lawson, George B. Luks, Maurice Prendergast, Everett Shinn and John Sloan, came together in 1907, under Henri’s leadership. In that year Henri withdrew several of his paintings from the annual exhibition of the National Academy as a protest against the exclusion of several younger artists. The Eight was founded immediately thereafter. Several paintings which have become especially well-known since 1908 are being exhibited at Brooklyn, including Wake of the Ferry by John Sloan and Chez Mouquin by William J. Glackens. The present show also includes many works which have seldom been on public exhibition, such as examples of the early work of Maurice Prendergast. Brooklyn Museum Archives. Records of the Department of Public Information. Press releases, 1942 - 1946. 10-12/1943, 135.